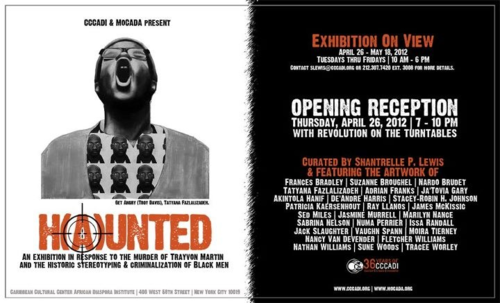 Tomorrow in Manhattan, the Caribbean Cultural Center African Diaspora Institute will be having an opening reception at 7pm for “H(a)unted,” an exhibition in response to Trayvon Martin and the historic criminalization of Black men. The exhibition will run from tomorrow to May 18th and Shantrelle P Lewis is curating it. Fyeahafrofuturism will be there as well. I cannot attend tomorrow, but I will go there eventually. Besides this exhibition, the CCCADI has also presented series like “Roots and Stars,” which is about Black spirituality, The annual Woman of Power conference and Village Work. Please support CCCADI (it is one of the places that I am considering interning at after graduation).